Mark has been working away, and we’ve been able to troubleshoot some of the action on the Solari displays. When I went to visit him at the Spikenzie Labs workshop, the first thing he showed me was a speed test. The Arduino system is able to control the flapping speeds as well as which numeral/letter comes up. Actually, it controls the millisecond delay between the turning of the flaps. We have a lot of play with how fast it will be able to go. In this video, Mark tries three flapping speeds—one slower, one standard speed, and one fast. We could go faster or slower, but if it goes too much slower it could fry the motor, and if it goes too much faster it could overheat! Some of these other home-made models are faster paced than the standard Solari board, but the artist we work with will need to determine how fast they want it to go. Next, I had brought over a different unit so we could test it out with the system Mark’s been working on to make sure there wasn’t a difference between the units. We hooked it up to the board, and it seemed to be glitching—when we set it to flip incrementally one by one, it was working fine, but trying to skip from the neutral position to a further ahead letter, it was falling short. We tried from a few different angles, but nothing was seeming to work. Finally, Mark had an idea—that the wheel was dirty! The wheel knows how to display the numbers based on the differential between the metal plates and the fiberboard wheel. It was falling short because it was registering the dirt on the metal plates as the fiberboard. He gave it a scrub with some rubbing alcohol and set it straight. We’re also missing two flaps (Which from 8 sets of 40 flaps per machine is a pretty good rate! ), and I’ve been working on replacing them. Matt had found a black plastic folder in the school bookstore which is about the same weight and colour as the flaps in the machine. We were worried at first that it would be too glossy (the flaps themselves are smooth and matte) but after holding them up next to each other, the match is pretty convincing. We wanted to try laser cutting them so we can have a few back-ups, or so the artist we work with could potentially play around with different signage by replacing the flaps, if they wanted to. I did a burn test on the plastic, which makers will know is essential for laser cutters—if the flame is green, the plastic has chlorine present, which releases a gas. 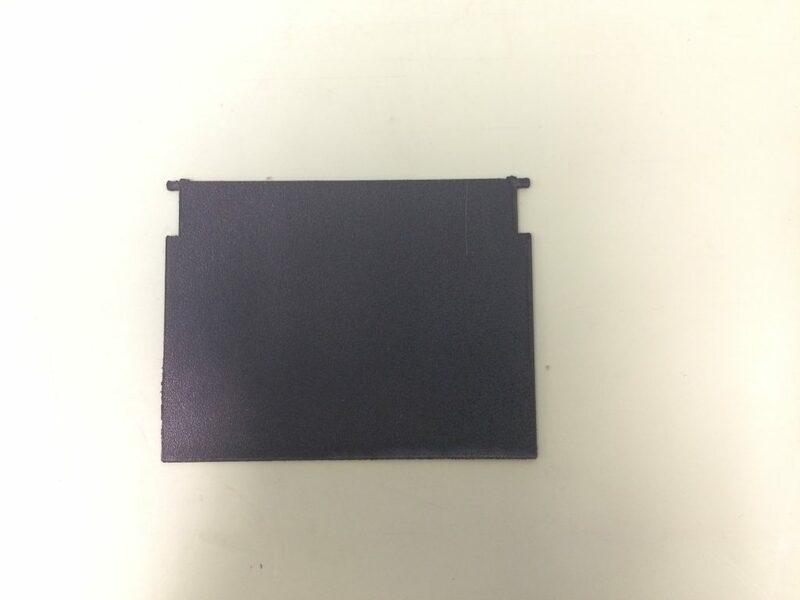 Not only is the gas toxic to the people laser cutting, it also has a damaging effect on the machinery itself. Blissfully, the flame was orange and not green! We carefully measured the dimensions of one of the existing flaps, and then I mocked it up in Adobe Illustrator. We sent the AI file to the laser cutter. After a few tries (the first ones were too slow, and melted the plastic) we came up with a clean, beautiful, laser-cut flap. This is totally exciting! Next, we’ll start work with a screen printer to print the missing letters on them. 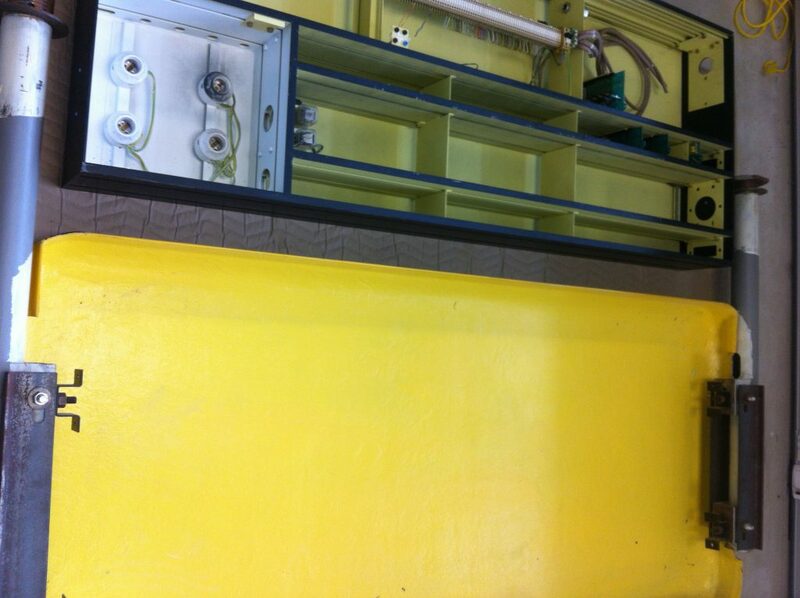 The guts of our Solari displays are a twisting rainbow of bright wires on the pale yellow paint of their metal shell. Mark, our man at Spikensie Labs, came in last week to have a look at the innards in order to see how the circuit he’s making will line up with the structure itself. 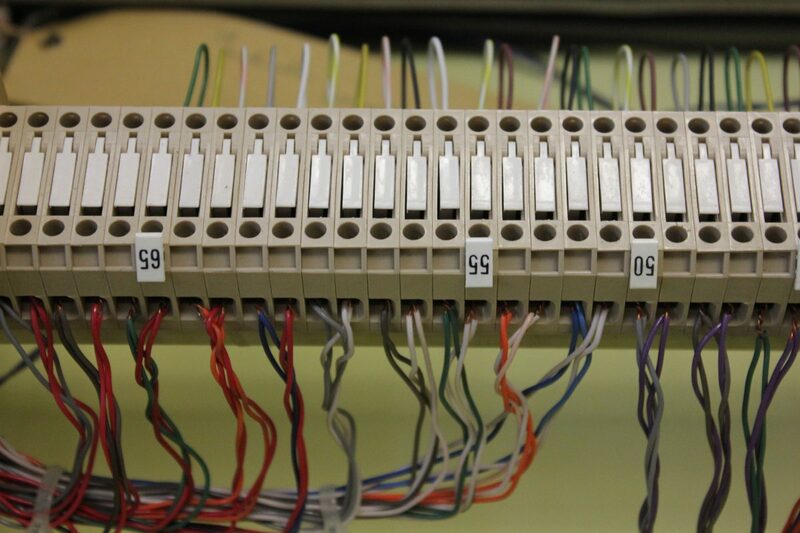 First, he was interested in testing out the connectivity of this patch panel, which in the original Solari configuration would have connected the 8 cartridges of letters and numbers to the programming unit. He was thinking that if the patch panel worked, it would be possible to connect our remade programming to the existing hardware of the unit. He attached power one by one to each of the six wires running from the back of each DIN-6 connector and ran the detector along the back of the panel looking for where the electrical feed was appearing. No such luck! For each wire, we got connectivity only 20% of the time. 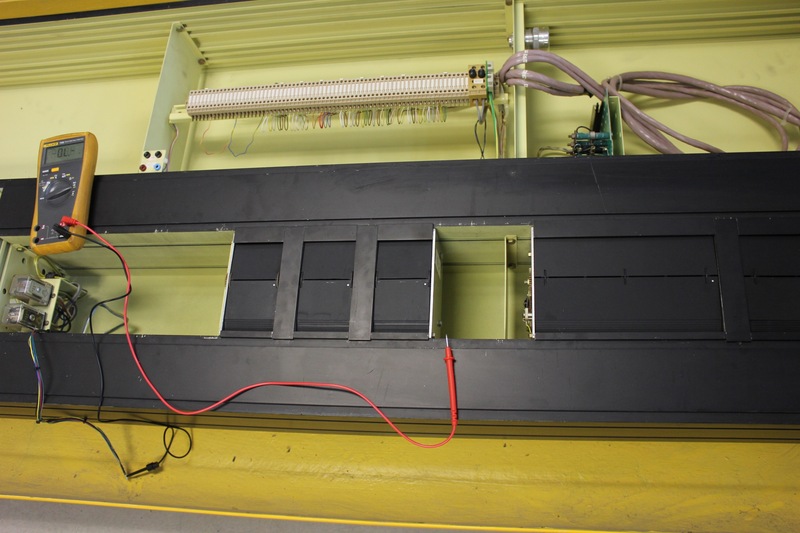 We took a look at the rest of the unit, and it appears that the signals connect to the patch panel through a series of four relay boards, which are currently interrupting the electrical flow. 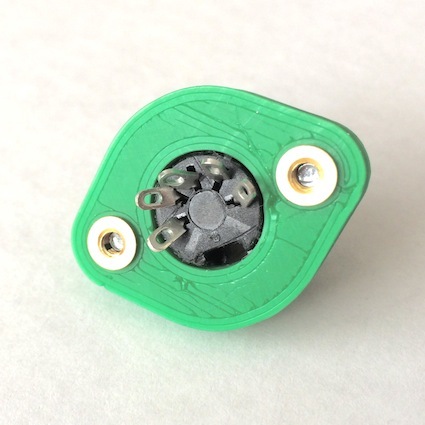 For those of you who like me are not-yet-versed in all matters electrical, a DIN connector is a form of electrical connector consisting of multiple pins within a protective circular sheath. It was initially standardized by the Deutsches Institut für Normung, a German standards organization—the German member body of the ISO (International Organisation for Standardization). As a term, DIN is less about cable type and more about standardization requirements. 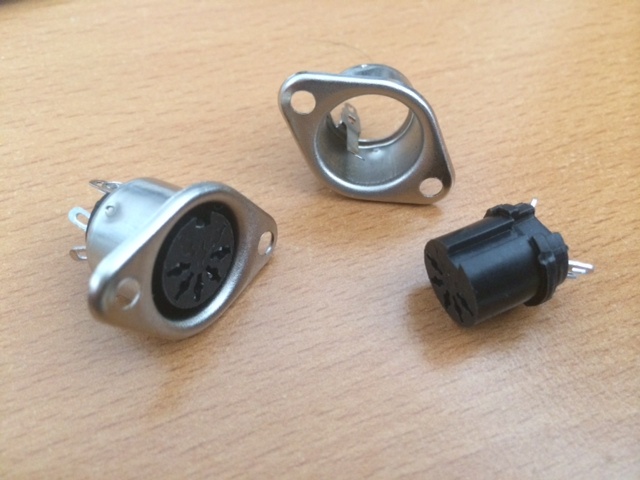 However, many DIN connectors consist of a round plastic sheath and a metal skirt, which keeps the sheath in place for a proper non-damaged connection. Developed in Germany, the connector gained popularity in the 1970s as a standard connecting device for audio equipment. Possessing the ability to carry many independent signals, it enjoyed use in electronics until the mid 1990s when changing technologies meant that fiber optic cables and other new mechanisms began to be more efficient. Still, those of us who have connected a microphone or a speaker might notice a trace of the DIN’s physical resemblance in the still-prevalent XLR cable commonly used for recording and stage performance equipment. (A fun even-further side-note: the XLR gets its name from its development history from the Cannon X connector, to gaining an L with a subsequent latch locking mechanism, and an R with its rubber coating.) 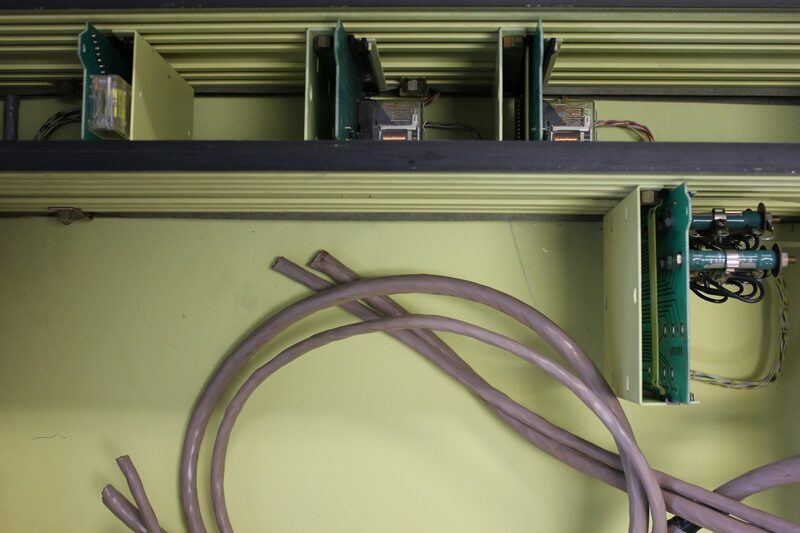 In our case, the DIN connector would have been a very popular piece of electronic equipment in 1975, when these Solari displays were manufactured for the 1975 opening of the Mirabel terminal. 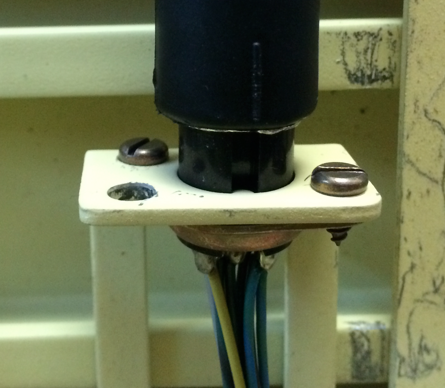 After some testing, Mark noticed that the black plastic part in the DIN-5 connectors he had were very similar to the connectors in the panels, though the metal part wasn’t. 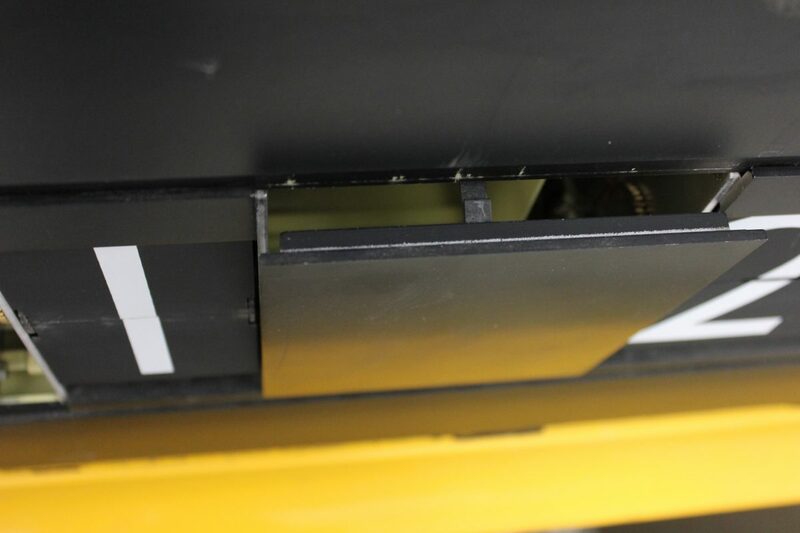 This is a tricky business, because the slots on the DIN needs to match perfectly with the pins on each display cartridge, sliding in and lining up exactly with the connectors. We tested the plastic part, and it’s an almost-perfect match—the originals are 7 mm and the new plastic parts are 7.09 mm. 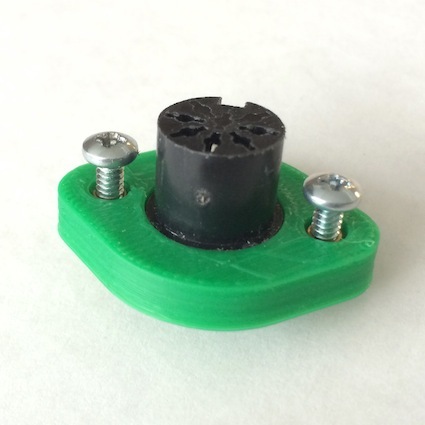 The plan now is to unscrew these two screws in the body of the Solari machine, use the guts of a new DIN-6 plastic part, and 3D-print a bracket to hold it (NB: for testing purposes, the photo is of a DIN-5 connector). Mark’s plan is to unscrew the existing plugs and tuck them into the panel—we’re trying to be as non-destructive as possible so that someone could choose a different restoration method in the future. Then, we’ll screw the new plugs and brackets into place with new wires connecting to our controller, completely avoiding the patch panel and the existing wires. Ray A. Rayburn, “A brief history of the XLR connector,” 4 July 2013, accessed 27 June 2016: http://www.soundfirst.com/xlr.html. I remember hearing, long ago, about an audio recording project. My dad told me about it after reading an article in the paper. Someone was recording clips of audio of sounds ‘on the verge of extinction.’ It was a project wrapped up in nostalgia bent on capturing and cataloguing different noises. A museological archive project, one that lamented the disappearance of certain sounds, sounds the project’s organizer found beautiful and wanted to share with the ambiguous future. Among others, one of those sounds was the clacking of the split-flap displays changing over on the arrivals and departures boards of terminals. Now that I’ve become familiar with sound studies, this initiative sounds a bit like The World Soundscape Project. Founded by Canadian composer R. Murray Schafer in the end of the 1960s at Simon Fraser University in BC, this international project sought to preserve sonic landmarks and dying sounds. Frustrated at ever-increasing levels of noise pollution in urban soundscapes and awareness that certain sounds were becoming obsolete due to changes in technology, Schafer and some of the WSP team (which would eventually grow to include the excellent soundwalk artist and acoustic ecologist Hildegard Westerkamp and granular synthesis expert Barry Truax) began capturing sounds. These would provide Schafer with examples of ‘good’ and ‘bad’ urban acoustic design, but also served to build an archive of sounds. The group would typically capture long uninterrupted takes of ambient noise, bells, ships, and mechanical and industrial sounds, including even the sounds of the recordist themselves – footsteps, pants shuffling, breathing. There have been several critiques of the WSP, from Andra McCartney’s troubling of Schafer’s notion of ‘good’ hifi sounds of quiet and nature and ‘bad’ harsh lofi sounds of the city, to Mitchell Akiyama’s analysis of the WSP’s ten-hour piece Soundscapes of Canada and the critical exclusion of non-European voices in the creation of that sonic narrative. However, there’s a nostalgia implicit in the WSP project that is inescapable. And possibly pieces of that same nostalgia is also woven through this Solari project, a longing for the analog past. This week, we wanted to see how easy it would be to switch the (very heavy) steel supports of the units. They’re currently set up to extend out from the top of the units, and hung from the ceilings when they were installed in Mirabel. We’re planning on rearranging them so they rest on the floor. Hence, we needed to flip the legs around. We were able to get the yellow front façade off with a little bit of work. The six screws holding each fiberglass side panel onto the steel framework require an unusually large squarehead bit to remove, and though we tried a number of bits, we weren’t able to find one big enough. We settled on using a flathead on an angle, and were able to at least get the top façade off. Matt and I then undid the eight heavy bolts attaching the legs to the unit using a ratchet and adjustable wrench. Those came off with little trouble. When we took the guts of the unit out to see what we were working with and set it too the one side, we both exclaimed at how lovely it was. “Yeah, what is it about them, that we find so beautiful?” Matt asked, “Is it the bright yellow and black and the crisp whiteness of the text? Or the simplicity, and how carefully done the old design is?” When I first saw a Solari Board, it was in a train station in Germany. I did feel something, some sort of delight. Standing in the station, hearing the cascade of white letters spilling down the blackness of the board. There’s something exciting about it. Maybe it’s the sound of it, the crisp clacking of the splitflaps as they cycle through options. Maybe it’s the action, the rush of analog movement stirring that doesn’t feel the same as a digital sign. But there’s maybe also something to be said about the act of preserving, too. In choosing to take care of something – to record it, to restore it, to activate it – you make it specific. It is not only a matter of having that thing, but also giving it value. It becomes a shared experience, the tug on a sleeve: Do you see this? Did you hear that? Isn’t it incredible? We’re still on the hunt for the appropriate screwdriver. But it looks like the legs should turn around just fine, and the unit is fitting neatly even when flipped (which means that the bolt distance is the same from the top and the bottom when turned around.